Blade Grind: Hollow Handle Length: 4.50" Handle Thickness: 0.44"
// Watch a breakdown of the construction and detailed look at the quality of this knife. Strong feel & amazing value but keep in mind it's a budget knife. // Emerson knives have long been respected and their patented wave design is a trademark feature for their tactical folders. 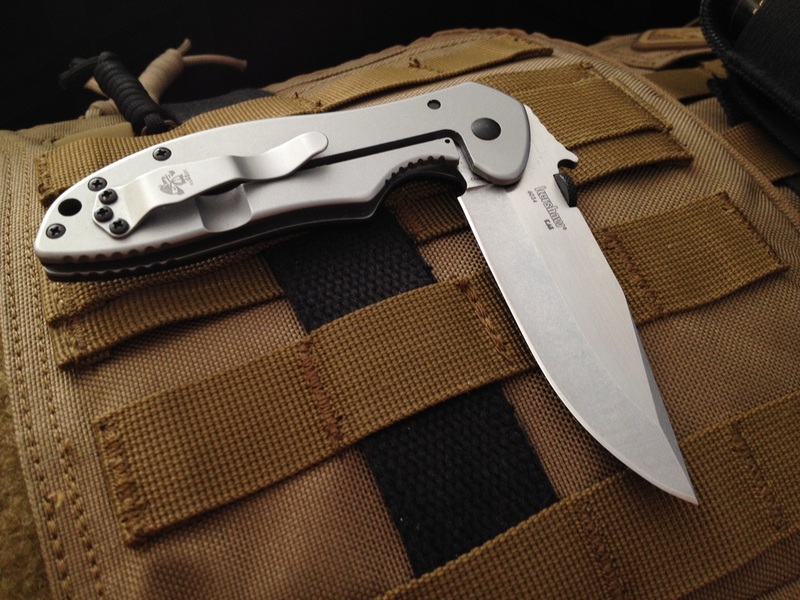 The CQC 6K is part of a new line of collaboration knives between Emerson knives & Kershaw. The knives are made in China and have an average level of construction quality and finish. The CQC models are very popular knives and these Kershaw versions are special because they come in frame lock versions. a heat gun & screw drivers of increasing size. The pivot screw also came with a bend in it from the factory assembler. Despite this, the overall feel of the knife is one of good construction. The washers are Teflon*. It is my opinion that the knife is a considerable good value and fine if you understand for the price this is not a knife that will last forever but is a good user. This statement is comparing to high end custom knives. feels sturdy except for the hardware. The blade edge comes stropped from factory. The knife also has a reversible pocket clip which is more end user friendly than the original Emerson knives. The knife is contoured very well with bevel work and rounding. The G10 scale has average traction. The deployment without the wave is slow because of the Teflon washers. The blade steel being 8Cr14MoV means it will be easy to sharpen to a clean edge and provide decent daily use but is not in the category of high quality knife steels that are tougher & more resistant to corrosion. // Tactical knives that don't have safety choils can be risky to rely on. The only other consideration is whether or not a person feels Kershaw frame locks are reliable which is a personal call. Mr. Emerson has stated that stabbing with a folding knife is not wise. // Critiques on popular products = unhappy fans, but the truth here is these knives make great users you can beat up on but they are value priced and therefore have compromises on durability. For tactical purposes it is recommended the end user stick to only emergency cutting not self defense unless they are very comfortable with no safety choil and a non bearing or assisted opening action. The wave feature is still something that will require dedicated training and from any type of compromised position will be a challenge to overcome. Overall these have monetary value but should be looked at as utility knives. For those collecting, these are American designs that only represent tactical knives offered by American manufacturers such as Emerson and Spyderco. Self defense with weapons is a very complex, dangerous and demanding situation. I recommend these primarily for EDC purposes and general work related cutting.